Buying a new roof rack means taking the time to plan ahead for its installation. If you want to avoid damage to your vehicle in the future, it is vital for you to pay attention to the system's installation. Keep some of these tips in mind before installing a new roof rack. All roof racks come with specialty secure locks that prevent your cargo from slipping out during the drive. Make sure that you pay attention to the condition and capabilities of the locks in order to enjoy the most secure usage experience. Get a friend to help you with the loading and installation process if you need to as well, especially if you are going to go on a trip with them. 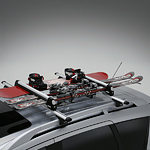 Those new to the roof rack installation should see Savage Kia in Reading for our installation options.